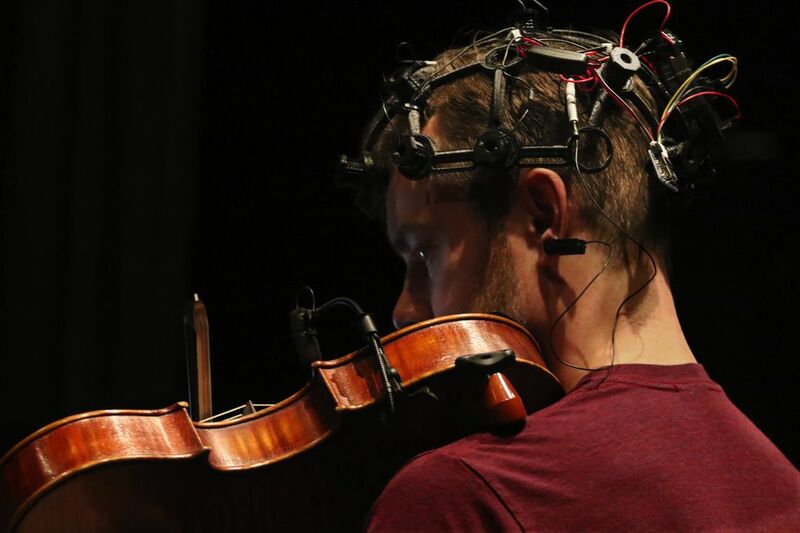 This is your brain on music: Neurologists, composers and tech-geeks at the University of Washington’s DXARTS program study music and the mind — including the encephalophone, a new instrument you can play without moving a muscle. In April of 2016, Seattle choir director and fifth-grade teacher Margaret Haney checked into the emergency room with an unusual problem — suddenly, she couldn’t sing. Haney thought she’d had a stroke, even though she showed no other symptoms: no physical weakness, no sagging in her face, no slurring. The physicians ordered some brain scans and discovered she was suffering from “amusia” — the inability to make music — due to a viral encephalitis infection in one section of her brain. After the tests, she was referred to Dr. Thomas Deuel, a Swedish neurologist who plays trumpet and guitar, studied musical composition and molecular biology at Princeton University, and then jazz at New England Conservatory in Boston. One of Deuel’s fellow physicians knew her music-minded colleague would want to see Haney — and might be able to help her with an unusual invention. Deuel had been working with DXARTS, a University of Washington program that incubates collaborations between scientists and artists. DXARTS was launched in 2001, with an emphasis on projects that boldly crisscross borders: video, performance, music, virtual reality, robotics and all-around tech-art hacking. 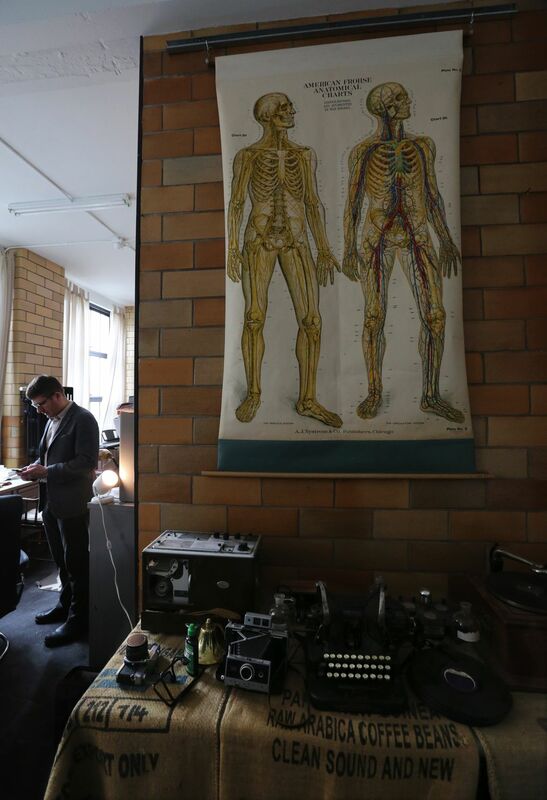 Lately, Deuel had advised DXARTS on building a lab, with state-of-the-art technology to study the relationship between neurology and art (particularly music), and explore deep connections between the body and the brain. 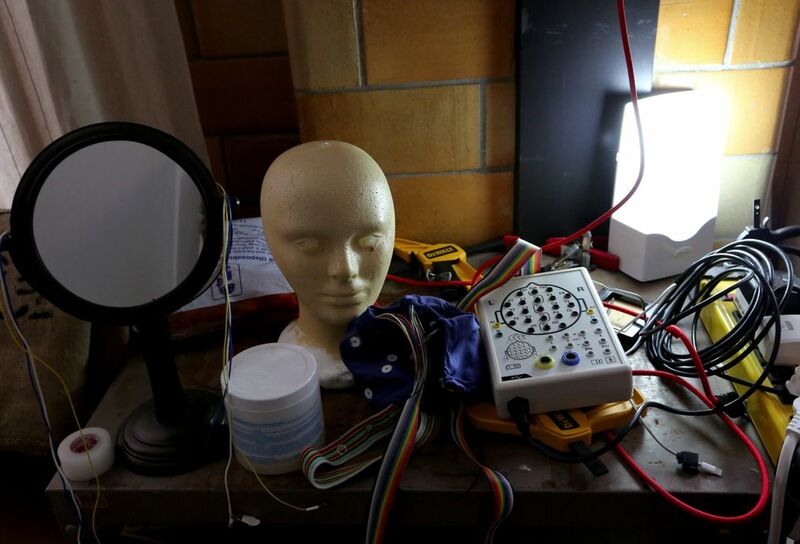 Deuel had also teamed up with UW-based physicist Felix Darvas on a neuro-musical invention: the encephalophone (pronounced “en-sef-ah-lo-fone”), an instrument you can play simply by thinking. Haney, Deuel said, “was a one-in-a-million case” who had the precise kind of brain lesion that might be ameliorated — though his hopes for a total cure were slim — with the encephalophone. 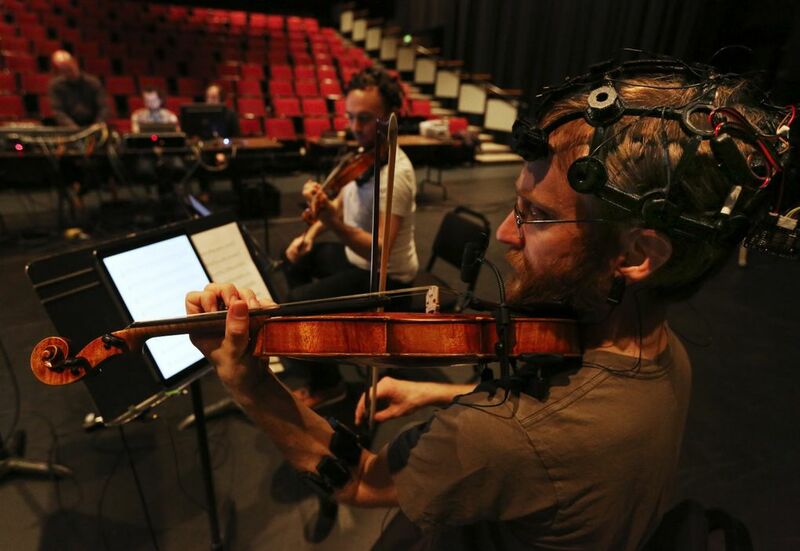 To play the encephalophone, a musician wears an electroencephalogram (EEG) cap fitted with electrodes that read brain waves and transmit them to a synthesizer. The EEG caps looks like a beanie without the propeller but protrudes a cluster of wires hooked up to amplifiers and computers. 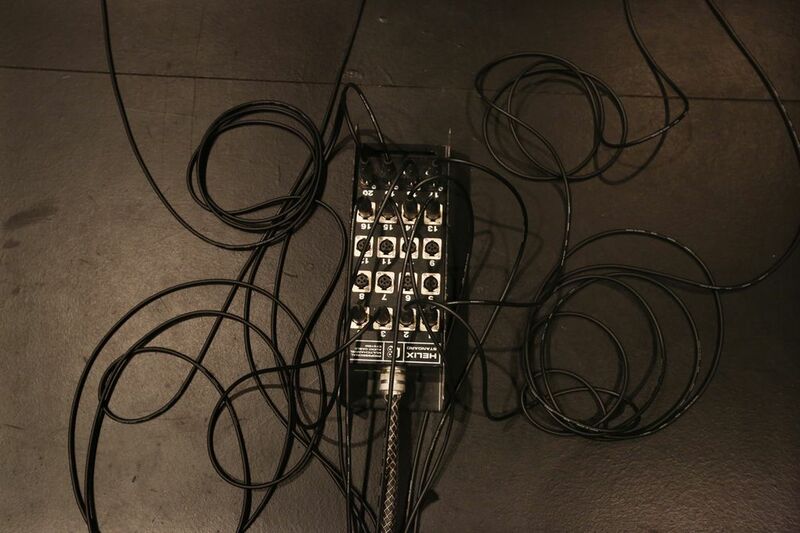 The instrument is a kind of “brain-computer interface,” and sounds like an electric piano, electric strings, or whatever other kind of music the connected synthesizer can produce. Scientists have been studying brain-computer interfaces since the ’70s, developing technologies that communicate between wired brains and external devices that, for example, allow people — or, in some studies, monkeys — to move screen cursors or robot arms with brain signals alone. The instrument is still in its early experimentation phases. Deuel and his collaborators — including DXARTS co-founders Juan Pampin and Richard Karpen — are waiting for approval from the UW to test the encephalophone in clinical trials, both to see whether making music improves patients’ quality of life and whether it might even help them improve their motor skills. When Deuel met Haney, he hoped the neuro-instrument could help her relearn how to sing. The encephalophone is just one part of the brain-music research underway at DXARTS, where Deuel is also affiliate professor. Before Deuel began working with Haney, Pampin (a composer from Argentina) had already been overseeing what he calls a “brain-art initiative, ” which has cobbled together funding from the Mellon Foundation, the National Endowment for the Arts and the UW, including the Bergstrom Award — a grant from UW chemistry alumnus Donald Bergstrom to build bridges between art and science. The DXARTS lab, Pampin said, has built up a small arsenal of high-precision machines to map a range of bio-neural activity: brain waves; the arm muscles of musicians while they play; how eyes move in response to stimuli; the bioelectrical activity on a person’s skin, in a technology also used for polygraph tests. 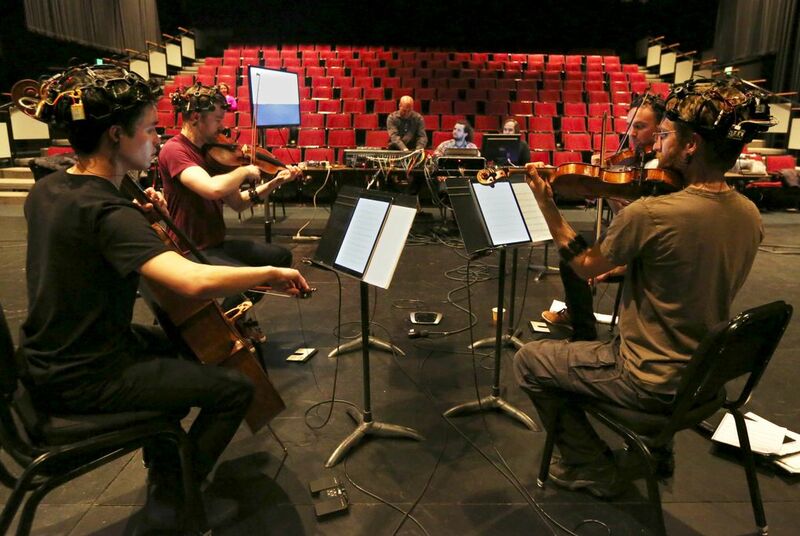 Members of the renowned, New York City-based JACK Quartet, for example, have been coming to DXARTS to wear EEG caps while playing together — or listening while colleagues play, or just thinking through a piece of music they know intimately. 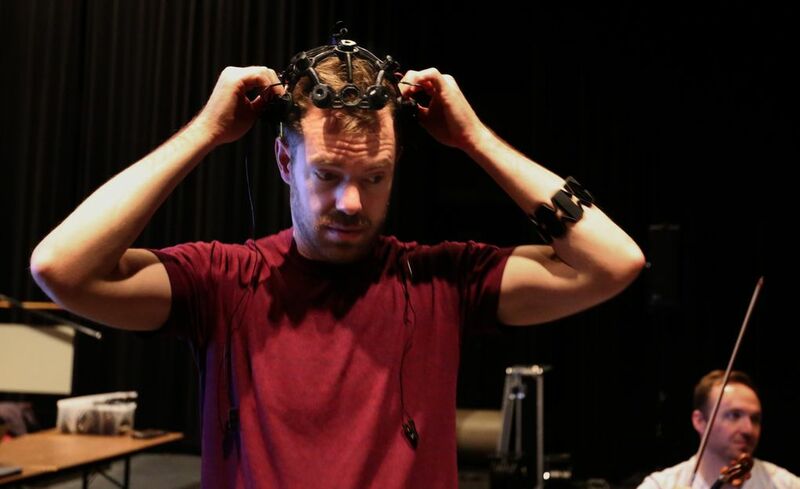 Deft players, like the JACK Quartet, are trying to help DXARTS discover new frontiers in the relationship between the body and the brain. While the musicians play, Pampin explained, they hear biofeedback tones: a synthetic sound, based on their own brain waves, that gets calmer and slower as they become more relaxed. And as they respond to the sound of themselves becoming more relaxed they, in turn, become even more relaxed. DXARTS’ split focus between music and science creates “a healthy tension” between the collaborators, Deuel said. With a little practice, a musician thinking about moving an arm or hand in one way — say, extending or contracting fingers, or thinking about moving an arm up or down — can move notes up or down an eight-tone scale. 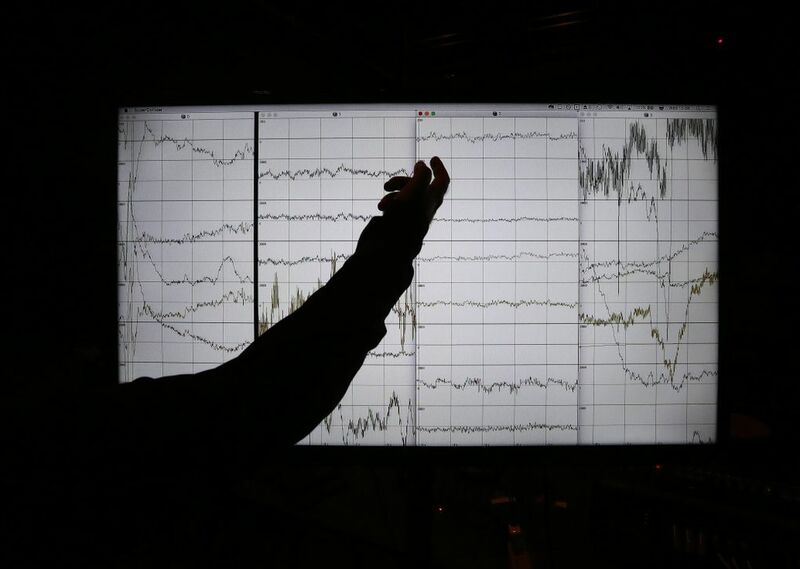 Electrical signals caused by those thoughts (or by those actions) move from the brain through the EEG cap. Those signals are then transferred to one computer (which processes the signals), then to another computer, which turns the signals into sound for a synthesizer. 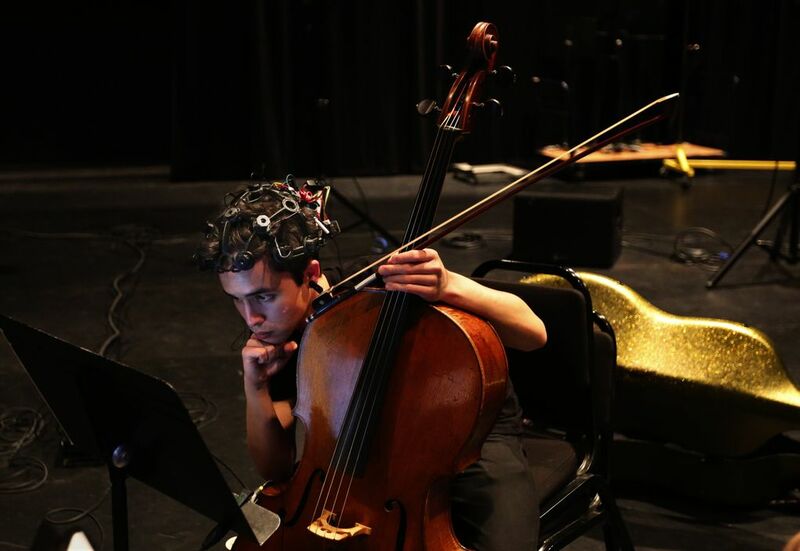 With more research and fine-tuning, patients like Haney, who’ve lost the ability to make music with one part of the brain, might be able to use the encephalophone to train themselves to make music using other parts and processes of their brains. “You have to learn to use the instrument,” Pampin emphasized, like training your brain to play a trumpet or guitar. 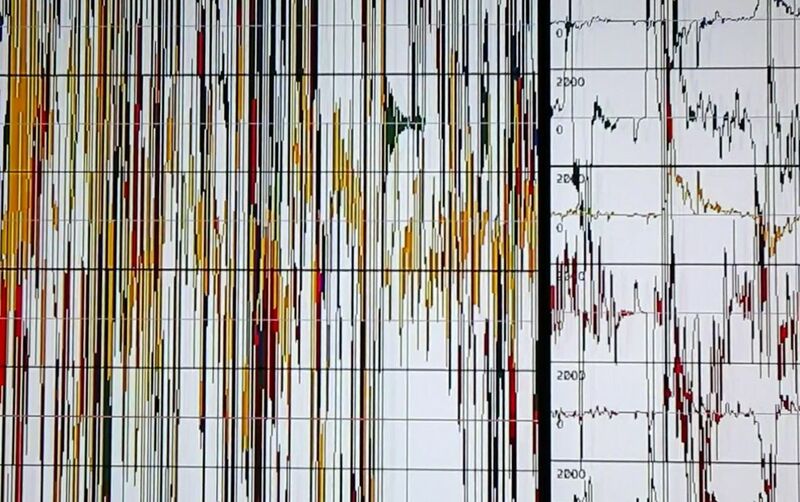 A related DXARTS project, spearheaded by associate professor James Coupe — who makes artworks about surveillance — is experimenting with drones that fly and shoot video directed by the brain waves of people while they’re asleep. Does DXARTS worry about the more sinister implications of honing intimate, brain-wave surveillance technology? Flying drones based on brain waves to shoot video is one thing — people flying drones with their minds for more violent or exploitative purposes is something else. 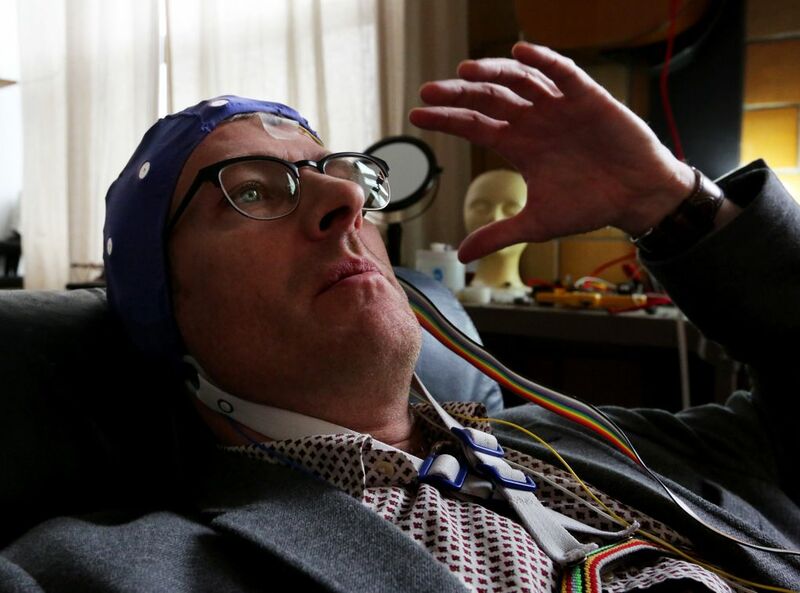 Deuel also has a pending patent for the BCI feedback technology that drives the encephalophone, which he said gives him some control over how its used. 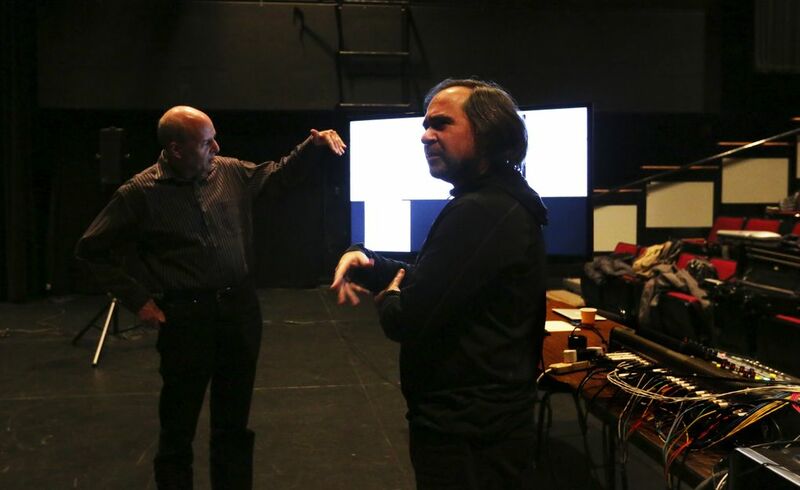 Pampin, Deuel and Karpin all stress that art has always been at the forefront of technological development: Pythagoras using math to define harmonics and scales, the inventions of Leonardo da Vinci, Beethoven thinking about the development of the contemporary piano and making strings taut. Whenever artists start experimenting with new computer technologies, Pampin said, there’s always some anxiety that the machines will replace the humans: “But this is human-centered research. The technology helps us see what humans can do — it’s always driven by the human-centered desire to know more about us. 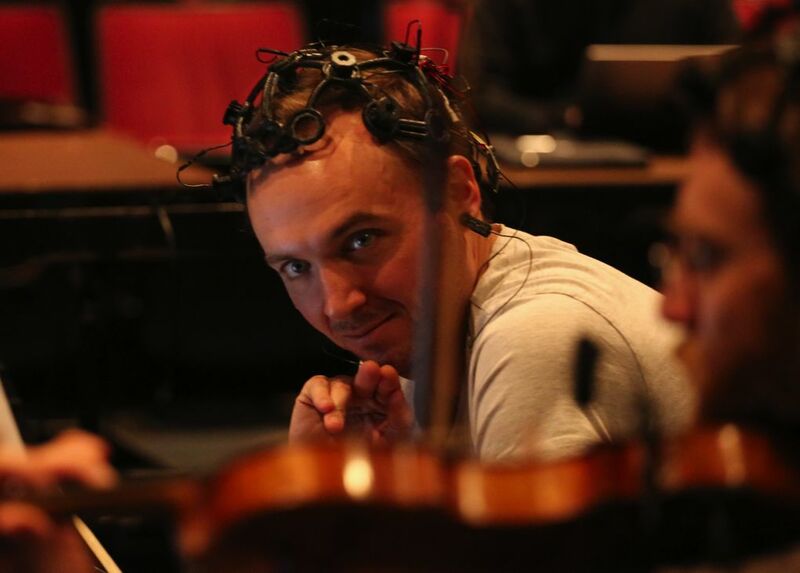 Deuel has performed on the encephalophone with a jazz ensemble, including one concert during last year’s 9e2, a series of nine evenings at King Street Station with performances and talks about the intersection of technology and culture. “We all have music inside us,” Deuel said. 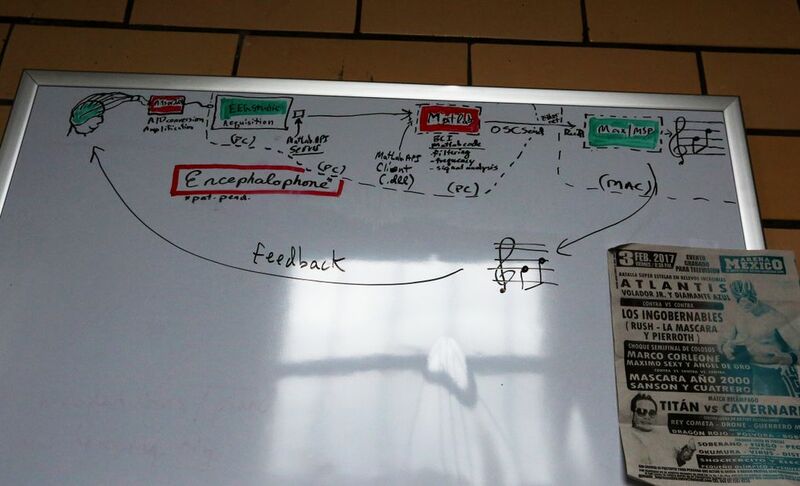 “What really drives this project is the ability to marry my interest in music cognition from a neuroscience standpoint and patient care, with having that intertwined with art and performance.” Someday, he said, patients who’ve learned to play the encephalophone with the motor cortex of their brains might be able to use that training to augment physical therapy and improve their ability to move. And Margaret Haney? Doctors at Swedish, Deuel said, treated her with antiviral medication to halt the spread of the infection — and the instrument helped relieve her amusia. Brendan Kiley: 206-464-2507 or bkiley@seattletimes.com. On Twitter @brendankiley.